It's Tuesday and I am behind with my post, but I have a good reason. 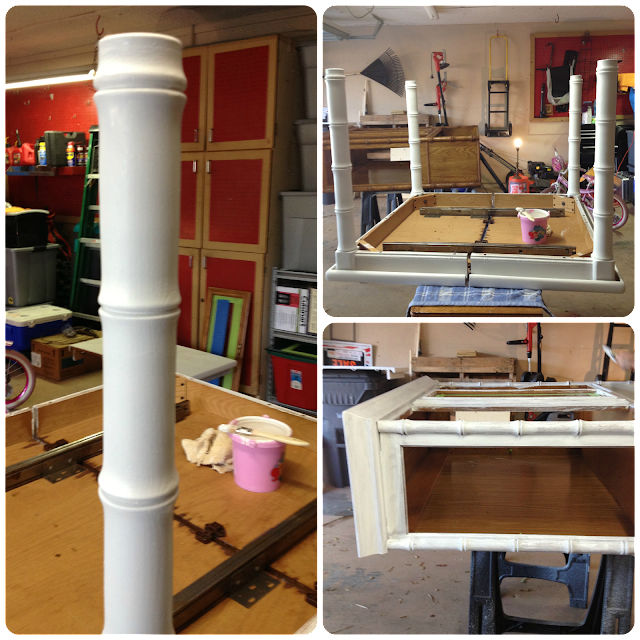 I have been painting furniture pieces since this weekend. 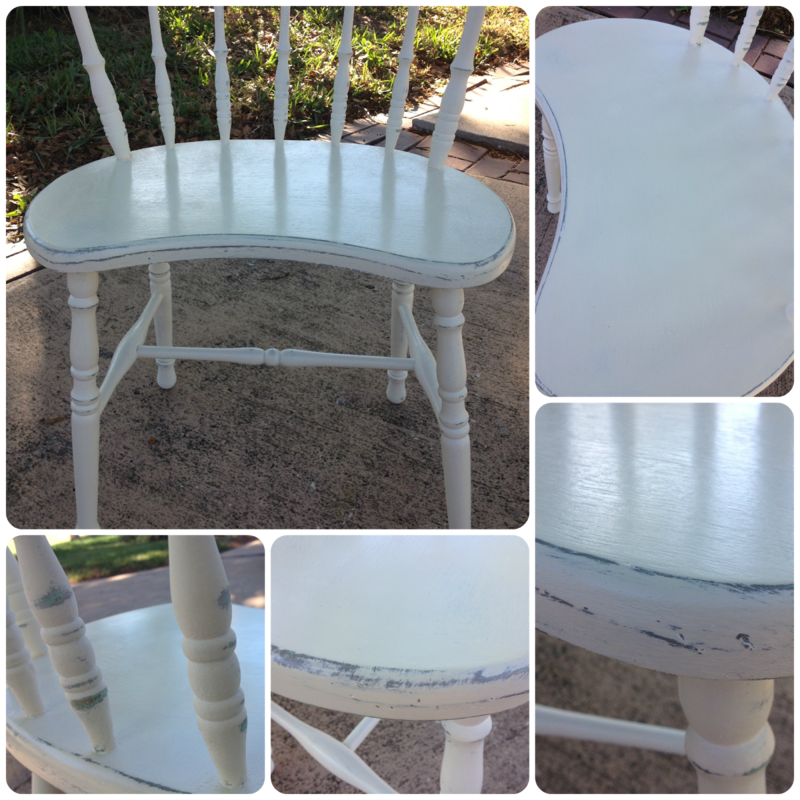 I have to say I have tried ASCP and homemade chalk paint. I do see a difference, however I like the consistency of ASCP. They both stuck to my pieces of wood and non-wood furniture pieces and all the pieces came out beautifully. This wooden chair I used ASCP in old white and French Linen. I love this chair and I am going to pair it up with a vanity table for my daughter. I just love this chair and I picked it up at a yard sale for $7. Lovely! These next pictures are a table and china hutch. I used my own chalk paint. I was very pleased with the results and I have to say I will use this method again. The reason why I would use this method again is because the cost is cheaper and two, I can take any color latex paint and make it into chalk paint. I used 1 cup of Plaster of Paris and 1 cup of hot water and mixed it well. Next I added 2 cups of Glidden paint in a white satin finish and mixed. The mixture should not be soupy but a like pancake batter. See In my own style for a full tutorial, Diane does a great job of explaining all the different paints and homemade chalk recipes. If you have any other questions just leave a comment or email me. I am grateful that you stopped by today and I pray you have a great week. 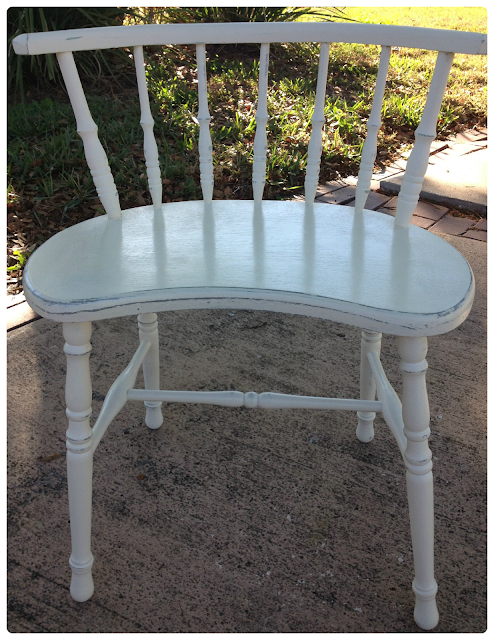 I've never tried making my own chalk paint but I love the idea of it. I like that you can make it any color that you want! I've been very curious about chalk paint. Thanks for the post! I haven't ever tried the ASCP yet, however I do find that the cece caldwell kind is nice to work with. I agree with you that because you can make any colour you like, the diy version is great too. And your little vanity chair is super cute! Wow, you've been busy! :) Love that little wooden chair-looks great! That's a great little chair and I love how you've finished it. Thanks for the comparison on the chalk paints. Very cute chair! I've used ASCP and haven't been overly impressed with it. I haven't tried the DIY chalk paint yet. Gorgeous! I've never used chalk paint before, but I've been itching to try it. I may just have to make my own! Thanks for sharing! Thank you. I appreciate you so much. Have a great weekend. The chair is gorgeous! Love it! That chair has the cutest shape! And I love the paint....I need to learn how to use ASCP. Adorable chair!! I have some things that I want to paint, but I'm so nervous!! I'd be thrilled if you'd link up at this week's Off the Hook! You've been so busy! I ordered my first can of ASCP a few weeks ago. I couldn't wait to test it out. Now I just need your energy to finish painting!! I have to say I love ASCP, I even painted my bricks with it, but its expensive. I really need to try to make my own. I'm going to try your recipe. Oh forgot to mention that your profile picture looks great!! What an awesome chair! Thanks for sharing it at my Twirl & Take a Bow Party! Have a great week! Beautiful makeover! I love how simple gel stain is to work with. It looks amazing! Thanks for sharing.